Our plan was to make today an easier ride, due to the late start. We set a goal to reach Armijo Canyon, 30 miles ahead, leaving 60 miles to a rest day in Grants. The road out of Pie Town was very sandy. I was in the back of the group, so I had the advantage of seeing Mathieu and Auke’s tire tracks on the road. They told a story of zigs and zags, searching for compact dirt, but often finding deep sand. Along the way, we met two Great Divide riders – Dan and Robert, who had done all other sections over past years. They started this trip in Abiquiu, NM and were headed to the border at Antelope Wells to complete the entire route. They warned of heat and scarce water between Grants and Cuba – the second longest waterless stretch of the entire route. We warned them of the sand that lay ahead of them…they said there was more to come for us, as well. We continued northbound – the sand wasn’t as bad as earlier in the day. Instead, we ran into many miles of straight, heavily washboarded, loose gravel roads. There was a strong tailwind coming from our left quarter, which made the miles surprisingly bearable. We arrived at Armijo Canyon very early in the day – around 14:30. There was no water available, so we decided to continue. A few miles down the road, we rejoined pavement. 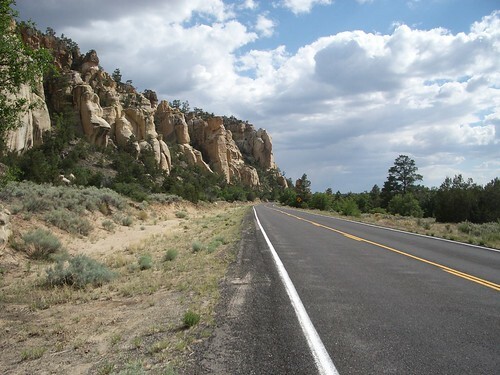 There were two options to get to Grants – 60 miles on the main route or 38 miles on the paved El Malpais alternate. We decided to push to Grants tonight via the alternate. Afterall, the tailwind would be a cross/headwind if we stayed on the main route. The alternate was quite scenic for being the alternate and paved. The road was lined by 1,000 year old lava on one side and golden rock faces on the other. Our tailwind shifted and the miles weren’t as easy as expected. Down the road, we met at a Subway just off I-40. I refuelled with a footlong BMT and multiple cups of Coke. 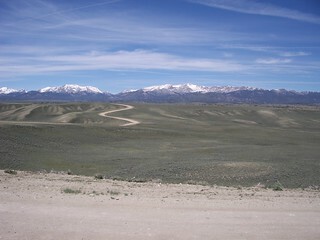 6 miles directly into the wind was between us and our rest day in Grants. We rode together, drafting (or trying to) as fast traffic from the left and a glass-filled shoulder on the right threatened. By the end of those 6 miles, my shoulders and neck were sore from being tense from avoiding Auke’s rear wheel and the broken remains of beer bottles. The discomfort melted away after checking into a hotel and having a hot shower. One would think a rest day would be relaxing…perhaps restful. They actually are not. Though we are off the bikes, there is much to do. We went shopping for the next few days (and bought far too much food), planned our next riding days, cleaned and maintained our bikes, did laundry, updated blogs, uploaded photos, and ate…a lot. Even though we had all day to take care of these chores (well, the eating wasn’t a chore), we still were awake far past our sunset bedtime. It seems that electric lighting has an effect on the body equal to caffeine. This entry was posted in Journal on June 20, 2010 by dave.